Tags: ancient coins, Ancient FLAGS, ancient indian coins, Armenians, bimetal coins, british india banknotes, byzantine coins, Byzantine Empire, byzantine flag, chola coins, COAT of ARMS of DYNASTY, coins exchange, Constantinople, cup shape coins, danish india coins, dutch india coins, exchange of banknotes, farmans, firman, french india coins, greeks, iksvaku coins, indian ancient coins, indian banknotes, indian coins, jesus on coin, king with cross, lead coins, Mythology on COINS, new nation banknote, New Rome, numis phil india, OTTOMAN, pondicherry coins, RARE SHAPE COINS, republic india, roman coins, roman empire, SAMOGITIA, satavahana coins, stamps exchange, sultanate coins, world banknotes, zemaitija. Mohandas Karamchand Gandhi (2 October 1869 – 30 January 1948) was the pre-eminent political and spiritual leader of India during the Indian independence movement. He was the pioneer of satyagraha—resistance to tyranny through mass civil disobedience, firmly founded upon ahimsa or total non-violence—which led India to independence and has inspired movements for civil rights and freedom across the world. Gandhi is commonly known around the world as Mahatma Gandhi (Sanskrit:mahātmā or ‘Great Soul’, an honorific first applied to him by Rabindranath Tagore), and in India also as Bapu (Gujarati: bāpu or “Father”). He is officially honoured in India as the Father of the Nation; his birthday, 2 October, is commemorated there as Gandhi Jayanti, a national holiday, and worldwide as the International Day of Non-Violence. The Byzantine Empire or Eastern Roman Empire, known to its inhabitants as the Roman Empire, the Empire of the Romans was the continuation of the Roman Empire during the Middle Ages, centered on its capital of Constantinople, and ruled by Emperors in direct succession to the ancient Roman Emperors. The Empire preserved Romano-Hellenistic traditions, but due to the increasing predominance of the Greek language, it became known to most of its western and northern contemporaries, but also to the Armenians, usually as the Empire of the Greeks. In the Islamic world it was known primarily as Rûm “Rome.The term “Byzantine Empire” was popularized by historians during the 16th–19th centuries. The Eastern Roman Empire’s evolution from the ancient Roman Empire is sometimes dated from Emperor Constantine I’s transfer of the capital from Nicomedia (in Anatolia) to Byzantium on the Bosphorus, which became Constantinople (alternatively “New Rome”). By the 7th century, increased eastern cultural influences, reforms by Emperor Heraclius, and the adoption of Greek as the official language, distinguished the later Roman character from its ancient character. During its thousand-year existence the Empire remained one of the most powerful economic, cultural, and military forces in Europe, despite setbacks and territorial losses, especially during the Roman–Persian and Byzantine–Arab Wars. After the Komnenian restoration briefly re-established dominance in the 12th century, the Empire slipped into a long decline, with the Byzantine–Ottoman Wars culminating in the Fall of Constantinople and its remaining territories to the Muslim Ottoman Turks in the 15th century. The game of playing cards began long back around 13th Century. Pieces of cards with numerical and pictorial sequences and various thematic markings were used to play the game. this is a game of skill and chance. Most probably this game was originated in Asia during the earlier stages. The number of cards has been sometimes 97 and some times 78 or 62. The special attraction of the bigger set of 97 was 21 cards called as outs at or trump cards. It was generally thought that the gypsies who came from the east have introduced the cards into Europe. In England the card game was thought as a Devil’s game from Asia. Here are some stories about the invention of the playing cards. As we Indians think the devil’s dwelling is towards the western part of the world, the Europeans think that anything remote and mysterious is devilish and Asiatic. In this background Saint Bernard in 1423 A.D said in a sermon that a devil has invented the playing cards Satan was nothing but “Satan” of India. 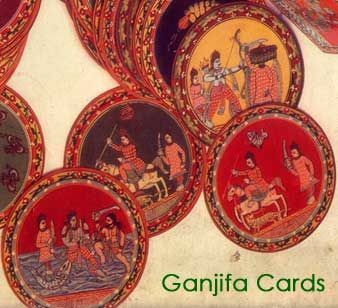 Its origin can be traced back to Chinese or Indian playing tablets or discs which have a resemblance of ganjifa cards based on Hindu mythological stories, the well-known chess game has also had its part in the development of skilled moves of playing cards. There was evidence that there were games played with cards in Egypt during the time of Joseph. And Queen among the cards can be traced back to Bible in the book of Judith. King was present in all nations’ packs. Queen was not present in Spain and early Germen pack. Earlier numerical signs were projected as eight batons or nine swords which caused lot of confusion which lead to fights in Italy because of small size cards, where it was a problem showing them clearly. Early French packs were simplified and were produced by stencil work, and were exported to other nations in Europe. This continued till tax was imposed in France over cards. And the card makers moved to Germany and Netherlands. Spanish pack has 48 cards only, without no.10. For more info see my blogs,if possible pass on this info ,forward my mail to your FRIENDS. Prime minister of INDIA Shri.Rajiv Gandhi released my book.